Walmart Inc. fell the most in more than two years after delivering a disappointing annual profit forecast, sparking fears that its bid to catch up with Amazon.com Inc. online is losing momentum. “We were a bit lower than plan” in e-commerce, Chief Financial Officer Brett Biggs said in an interview. “We had a few operational issues from an inventory replenishment perspective,” he said, declining to provide specifics. shares fell as much as 9.5 percent to $94.80 in New York Tuesday, the biggest intraday decline since October 2015. They had gained 6.1 percent this year through Friday’s close. Walmart can’t afford to lose ground as rival Amazon poaches shoppers and pushes into new arenas like health care, which has prompted a scramble of consolidation including the union of CVS Health and insurer Aetna Inc. On Tuesday, grocer Albertsons Cos. said it would buy the part of drug-store chain Rite Aid Corp. that isn’t being sold to Walgreens Boots Alliance Inc. Insurer Humana Inc. and drug-plan administrator Express Scripts Holding Co. could also be potential takeout targets, according to analysts. McMillon is also trying to keep employees happy by raising wages and enhancing parental-leave policies, while at the same time closing stores and cutting headcount at its headquarters. Those investments, together with lowering prices, are taking a toll on profit. Gross profit margins in the U.S. contracted by 50 basis points in the quarter, said Biggs, who added that he doesn’t see that level of decline continuing. “There was some sacrifice in gross margin in the quarter, which we attribute to holiday promotional activity in the U.S., as well as the impact of the ongoing price-driven market share battle with Amazon,” Moody’s Corp. analyst Charlie O’Shea said in a note. Walmart’s adjusted earnings amounted to $1.33 a share in the fiscal fourth quarter, which ended Jan. 31. That was short of analysts’ average projection of $1.37, and was partly due to pulling forward some investments to take advantage of a greater tax deduction, the company said. 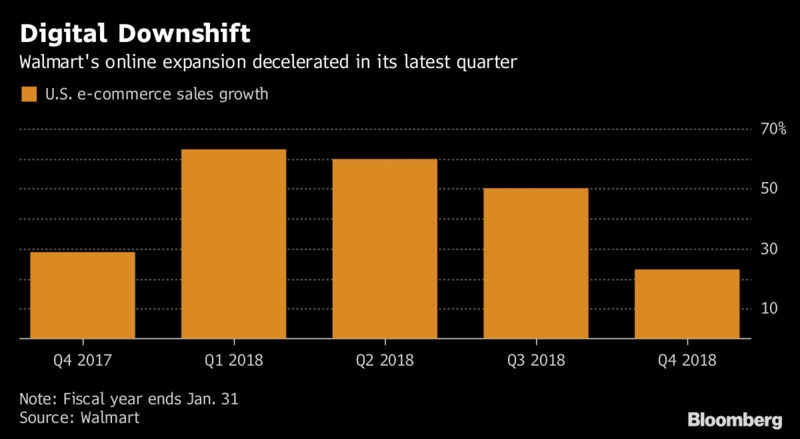 One bright spot was same-store sales, which grew 2.6 percent during the quarter, compared with the 2 percent projection tracked by Consensus Metrix. The increase was fueled by sales of food, apparel and toys such as Lego and Hatchimals, Biggs said. forecast by as much as half to a range of 1.5 percent to 2 percent, due to its decision to halt tobacco sales in some Sam’s Club warehouse locations and shutter part of its Brazilian e-commerce business. The company also closed 63 Sam’s Club units last month. Walmart said it’s still assessing the impact of last year’s federal tax changes — legislation that’s expected to bring huge benefits to the nation’s retailers. For now, the company is recording a provisional benefit of $207 million for the fourth quarter and full year. It sees an effective tax rate of between 24 percent and 26 percent, which is “a little higher than some expected,” Biggs said in the interview. The company said it expects a cash benefit of about $2 billion for the year as a result of the tax overhaul.